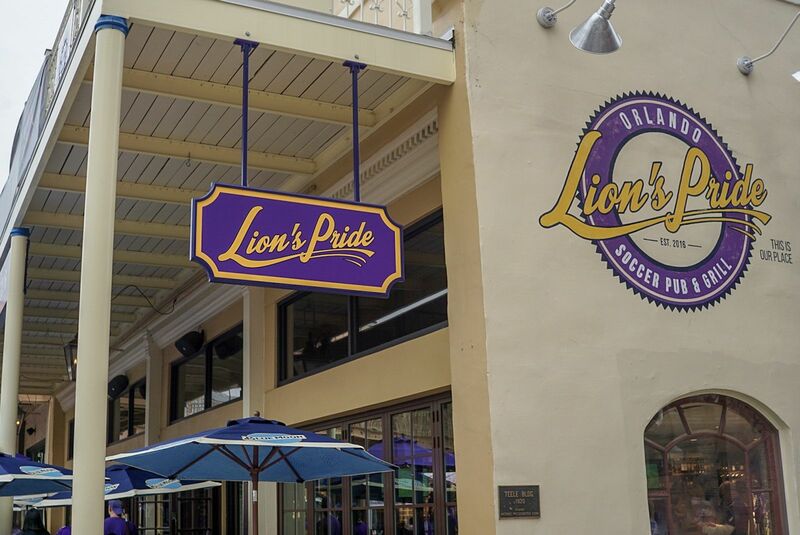 No matter if it’s game day or not, soccer fans are in luck with “Lion’s Pride Soccer Pub & Grill” bringing a slice of the Orlando City Stadium right to Church Street. Open since May of 2017, Lion’s Pride serve up a true sports fans entertainment facility that showcases soccer, along with many other world sports events. The impressive 9,500 square foot sleek, historic, comfortable restaurant features over 40 televisions, including a 200-inch big screen, and the official Orlando City Soccer Club and Orlando Pride Merchandise Store. The diverse menu, crafted by Executive Chef Scott Phillips, features traditional sports bar favorites elevated to a new level, including appetizers like wings, sliders, tacos and flatbreads, plus a wide selection of sandwiches, entrees and tasty Lion’s Pride signature dishes. Visitors of Lion’s Pride will feel like they’ve walked into the Orlando City Stadium and a soccer-centric paradise, which houses a replica of the stadium scoreboard and a World Cup soccer balls collection signed by players of the World Cup who’ve dined at Lion’s Pride, such as Ronaldo “Phenomenon”, Rivaldo, Kaka, Alex Lalas, Julio Baptista Elano, Doni and Robinho. Plus, Lion’s Pride houses an exclusive second level, featuring stadium seating and private suites, perfect to host corporate or special events of all sizes. (Orlando City Soccer Club Home Games) $30 All-You-Can-Eat-And-Drink Tailgate Party with unlimited draft beers, Sangria and finger foods. (Orlando City Soccer Club Away Games) Buy a Heineken draft during the first half and receive a complimentary draft at halftime. (Anytime) Play the World Cup Free Beer Challenge and make your bracket picks. Participants who get all the teams correct thru the final match win two free draft beers daily until World Cub 2022. (Monday-Friday) 11am-2pm Buy 5 Lunch Specials, Get 1 Free; 5pm-8pm Happy Hour with $5 Red/White Sangria, $3 Select Beers, $4 Wells. *Save-the-Date: Central Florida’s best World Cup 2018 Watch Party at Lion’s Pride starting Thursday, June 14 through Sunday, July 15. Experience Lion’s Pride Soccer Pub & Grill at 123 West Church Street, Orlando, FL 32801. Lion’s Pride serves lunch and dinner daily. Hours of operation: Sunday-Thursday 11:30am-10:30am, Friday-Saturday 11:30am-11:30pm. For more information, call 407-203-4099 or visit www.lionsprideorlando.com.